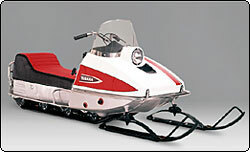 The root of all Yamaha snowmobiles, this stylish, white machine was introduced as a test model with technology gleaned from more than a decade of motorcycle manufacturing. 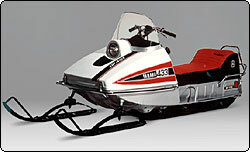 The SL351, Yamaha's first full production model, introduced oil injection and slide-valve carburetors to the snowmobile industry - features that are still in use today. The SS396 provided a high level of performance for it's time. 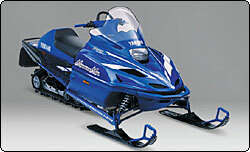 Its 'pulse-tuned' muffler design delivered performance that snowmobile enthusiasts were searching for. 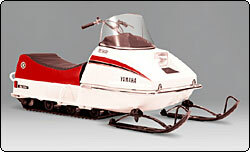 The first Yamaha sleds with reverse gear were the SW396 and SW433. 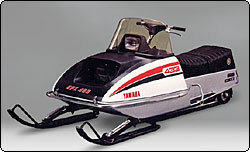 The first Yamaha sleds with convenient electric start were the EW643 and EW433. This incredible race machine boasted awesome handling and speed that left even the 650cc sleds behind. 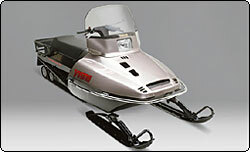 The SM292 mounted the SL292's proven single-cylinder engine on a new, compact, lightweight chassis. The combination gave this model responsive handling and an excellent power-to-weight ratio. 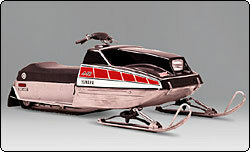 Designed specifically for oval Stock-class racing, the GPX433 had a front-mounted engine and Yamaha's first production slide rail rear suspension that provided a revolutionary advance in performance and handling. 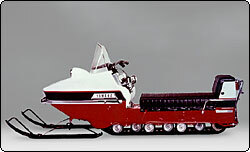 Together with its smaller brother, the GPX338, these machines dominated competition on the racetrack. 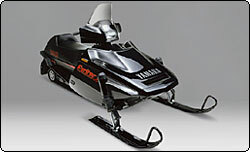 The first Yamaha production sled with liquid-cooling. 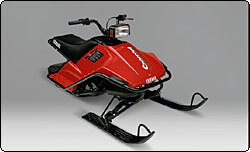 This high performance model's innovative radiator / heat exchanger cooling system introduced new technology to the sport, but it was the sled's winning ways on the racetrack that made it a legend. The liquid-cooled SRX340 was also introduced this same year. 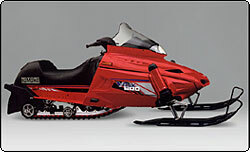 With a forced air-cooled engine built upon the race-proven GPX chassis, the Exciter 440 provided performance for every family member, from the sport-minded enthusiast to the touring-type snowmobiler. 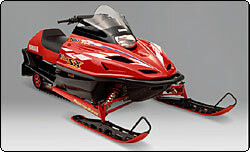 The Enticer 250 featured a new single-cylinder engine housed in a lightweight, compact package. Its friendly powerband, light weight, wide stance and short track offered responsive, exciting handling. 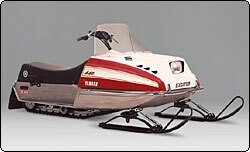 Built for snowmobilers who wanted to ride long and far in ultimate comfort, the EC540 boasted a 16.5-inch track and standard electric start. 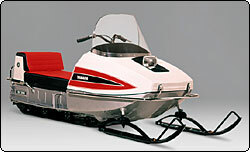 The SRV was the first snowmobile to utilize the Yamaha Telescopic Strut Suspension (T.S.S.) design. The machine performed especially well over the rough terrain typical of cross-country racing. 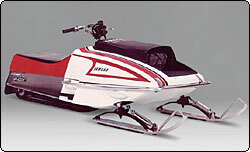 The first model of the famous Bravo line, the BR250 was a hit with everyone from beginners to veterans thanks to its compact engine and incredibly light frame. The Bravo set the standard for lightweight machines. By introducing Yamaha's first 'ProAction' rear suspension on this model, the SRV became famous for offering superior ride quality over competitive models. 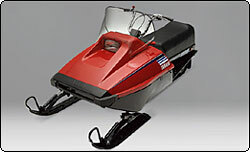 Developed to offer real sports riding in a variety of conditions, the Phazer was light in weight and featured a powerful, lightweight fan-cooled engine and an aerodynamic, handlebar-mounted fairing that began a new era in snowmobiling. 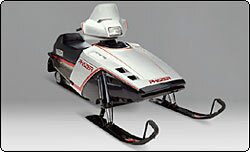 The Phazer would become the best-selling snowmobile in the world and rocketed Yamaha to No. 1. 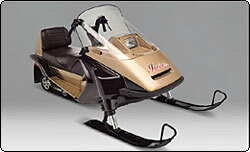 A snowmobile that certainly lived up to its name, the Exciter built upon the Phazer success by introducing liquid-cooled twin-cylinder power in a great-looking package. 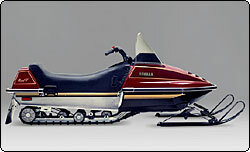 The Yamaha-exclusive handlebar mounted fairing continued to set this snowmobile apart from the competition. 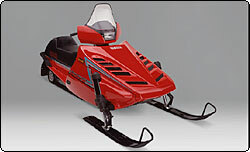 An amazing amount of fun in a tiny package, the SnoScoot was a hit with kids of all ages. 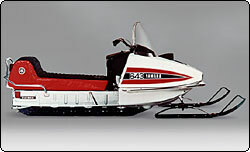 The SnoScoot used an 80cc scooter engine and lightweight tube frame for a completely different direction than the typical snowmobiles of its day. This unique machine was built to attract new riders to the sport. A revelation in the utility machine market, the VK 540 boasted a 20" wide, 156" long track, reverse and high/low gear selection. 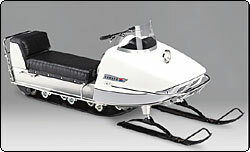 The heavy-duty model won the hearts of many and became the utility sled standard. The Exciter II featured lightweight and durable dispersion-coated plated cylinders, industry-leading Digital C.D.I., a large-ratio clutch system, new ProAction rear suspension and new hood styling. A truly ground-breaking machine, the Vmax-4 featured an impressive four-cylinder engine and one of the highest displacements of its day. 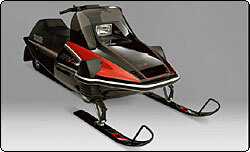 One of the first true "musclesleds", the Vmax-4 won countless awards from industry press and victories on racetracks, where it was nearly unstoppable. 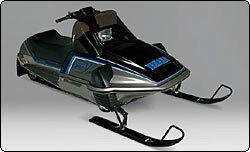 An evolution in the Exciter bloodline, the Exciter II SX used an advanced T.S.S. front-end for more aggressive cornering. An immediate success with high-performance enthusiasts everywhere. 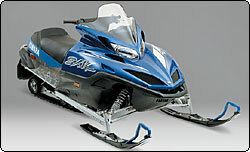 The Vmax 600 raised the bar by combining trail-riding power and comfort in a great looking package. 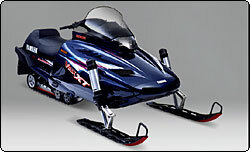 In addition to the Vmax 600, Yamaha also introduced a complete 600cc and 500cc model line-up with luxury touring, 2-up touring and long-track deep-snow versions. Key styling cues were taken from the powerful Vmax-4 to give the Vmax models a strong Yamaha identity. A more advanced, more powerful version of the 1992 model, this new Vmax-4 had 800cc of pure 4-cylinder muscle roaring under its hood. It remains a force in drag racing to this day, nearly 10 years after its initial release. 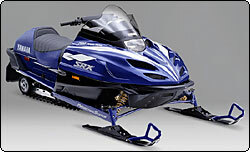 The Vmax 600 XT became the sled of choice for riders seeking a powerful engine and a superb long-travel suspension. The XT was perfect for those who wanted impressive performance in a comfortable package. 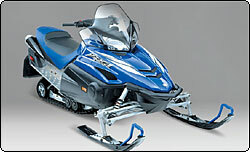 The SRX 700 continued the SRX legend by delivering triple-pipe power and precise ndling in a great-looking package - completely dominating the Top Performance snowmobile category, both in sales and in competition. This model included industry first, self-cleaning exhaust power valves. 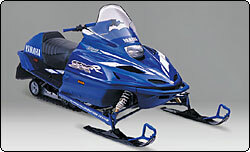 The Mountain Max 700 was the perfect sled for mountain riding. With an exclusive 141" deep lug track design; smooth, immediate power from its lightweight triple-cylinder engine; and incredible floatation from the ProAction Mountain rear suspension, the Mountain Max 700 excelled in deep powder, on steep climbs and even on rutted mountain trails. 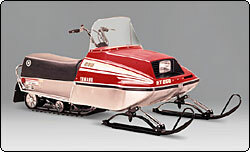 When first introduced, the SX 700 R was perhaps the best handling trail machine ever, according to the snowmobile press. Powered by Yamaha's sleek, single-piped triple-cylinder engine, the SX-R boasted outstanding suspension, allowing riders to pound through the toughest terrain with ease. 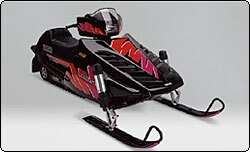 Proof of the SXViper's appeal, it was the industry's largest-selling model in 2002. Far more than simply a design landmark with its aggressive styling, fluid lines and awesome ergonomics, the SXViper is an incredible trail machine with its potent triple-cylinder single-pipe engine, light-but-rigid chassis and superb handling. 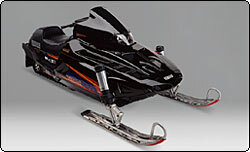 The RX-1 changed the look, feel and sound of high-performance snowmobiles. Combining four-stroke motorcycle engine technology with an all-new chassis layout, the RX-1 delivers the optimum combination of four-stroke performance, handling, durability and style. 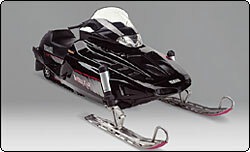 The RX-1 is the industry's first four-stroke, high-performance snowmobile.